I had the pleasure of visiting Machu Picchu in August of 2017. Like many others, Machu Picchu has been on my bucket list for a LONG time. Out of the blues, tickets were lower than usual and I jumped on it. Seeing Machu Picchu will put you in a state of awe. Experiencing Machu Picchu in person will put your mind at work as you start wondering all the careful work that the Incas must have put in. You will truly appreciate the architecture that the Incas built hundreds of years ago. I visited Machu Picchu without a tour guide, which is not a hard thing to do! Going on your own will save you money, and it will also allow you to adventure out on your own time. This allows you to be either the first person or the last person – or even both – to visit Machu Picchu for the day. This guide will help you plan a trip without the Machu Picchu tours. View my top 8 amazing photos of Machu Picchu! The day began at 3:00 am when we prepared for Machu Picchu. We had to check out at 11:00 am but our host allowed us to store our bags in their closet without charge. It was cold, but my only focus was getting to the bus stop line. At 3:40 am we were the 200th person in line, putting us in one of the last busses for departure. As the time got closer to 5:00 am, we were checked for our passports, bus tickets, and Machu Picchu receipt which allowed us to enter the bus. Heading up at dusk, the road was dark, but we were able to see dark figures of day-hikers walking along the bus route. Here is a short clip of the bus ride up to Machu Picchu. I want to highlight how early and dark the morning ride is. By the time we got to the gates of Machu Picchu, the sunlight was present and there was already a huge group of tourists ready to go in. There are 4 lines for the entrance. Make sure to pick a line even as it seems like people just make a jumbo pile up for 1 line. It’s also extremely important to bring the Machu Picchu tickets and passports to gain entry. Our buddy actually forgot his tickets. He was then placed in the furthest left line for customer service to assist him (this will take an additional 15-30 minutes). When we entered, the staff stamped our receipt. What we didn’t know was that we needed to stay together! The stamp is required to get through the access points for Huayna Picchu or Montana Picchu if you bought those extra hikes. There was a 30% chance of rain for the day. By the looks of the clouds, I thought it might happen. It’s crazy how fast weather can change in the high altitudes. We lucked out, and the clouds cleared up fast. The view of Machu Picchu city started to show as the clouds slowly unshrouded. Machu Picchu is an amazing city built on ingenuity and precision – the Incas were masters at stone cutting. The ancient city tells many stories as you take each step along the ruins. But what really fascinates me is how heavily guarded the ruins are. Security guards and tour guides are constantly at watch to call out anyone that violates a rule – leaning against the 100 ton stone wall will have the whole yard blowing their whistles at you! The intense regulations at Machu Picchu will have you constantly worrying about what’s allowed and not allowed. Also, Remember to take your time walking around the ruins because you’re not allowed to backtrack. The path is a one-way walking zone, and you will be required to circle the city to get to previous areas of the ruins. A short clip of the traffic in Machu Picchu and it’s one-way walking system. Our hostel had prepared snack bags for us – so grateful for them, I was dead hungry. Eating is restricted in most areas of the city. We had seen a lot of people sit and ate food at the higher grounds overlooking the city as well the access point for Huayna Picchu. As we sat, we saw hikers coming back from the intense hike. What caught our eyes was how badly their skin was bitten by the bugs up there – some worse than others. Some with dozens of inflamed red marks on there calves and arms. I highly recommend bug spray. I really wanted to stay for sunset, but our train to Poroy was at 5:30 pm so we had to leave the park early. Somehow the weather had been perfect for us. Around 4:00 pm rain pouring non-stop – an 8-hour delay. Machu Picchu is located in the Cuzco region of the Urubamba Province. It is 50 miles North West from the nearest airport, Cusco, and is on the eastern slopes of the Andes. The city of Machu Picchu overlooks the Urubamba River as it lies on a saddle between two mountains, Machu Picchu and Huayna Picchu. There are many ways to get to Machu Picchu. The original entrance to Machu Picchu required a backpacking trek across mountain ranges before getting to the city. Over time, new routes have been made to reduce a number of miles that needed to be hiked. Now, you can get to the ancient city of Machu Picchu by bus. No matter what option you choose to get to Machu Picchu, there is a similar route that everyone must first take. Once in Lima, Peru, you will need to get to Cusco, Peru. You can get to Cusco by plane, car, or bus. The plane is the cheapest and fastest option. Below is a list of popular trails, like the Inca Trail to Machu Picchu, and alternative trails to Machu Picchu. There are other alternative routes as well. This hike is also known as the Classic Inca Trail to Machu Picchu. This is the original path that the Incas would take to Machu Picchu. Prepare to have at least 4 days and 3 nights of hiking. Starting Point: Near Ollantaytambo, alongside the railroad tracks. The Short Inca Trail to Machu Picchu usually takes 2 days. The starting point of this trail was founded to reduce the distance of the original route, and reducing the time needed to hike. You will first need to take the Peru Rail or Inca Rail to Aguascalientes. The town is the starting point of the trek. You will walk along the bus route to the main entrance of Machu Picchu. I personally used the Peru Rail from Ollantaytambo. A roundtrip ticket costed by about $140 USD. Just like the previous option, using the Peru Rail or the Inca Rail is required. Due to the limited amount of time I had, this was my only option. Tickets are not available to be purchased online. However, I recommend getting your bus tickets a day early at the ticket office in Aguascalientes if you plan on being one of the first visitors in the morning. You will also need to be in line at 3 am to 3:30 am. We arrived at 3:30 am with about a good 150 people in front of us. Officials will also check that your Machu Picchu ticket before boarding the bus. Machu Picchu is one of the most visited destinations in Latin America. Make sure to buy your tickets online early before they sell out! There are a few choices you can buy. 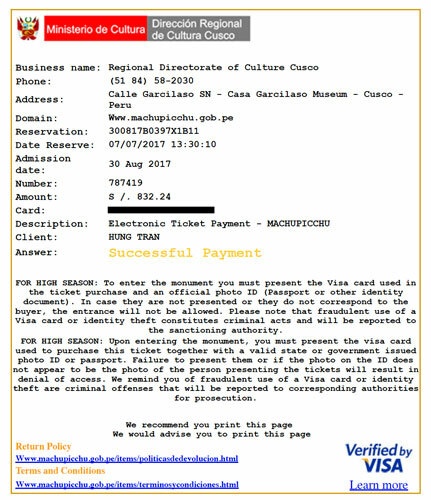 You can buy the basic permit that allows you to in just Machu Picchu city (the ruins). You can also buy the additional permits to hike up to Huayna Picchu and Machu Picchu (Montana Picchu). The Machu Picchu with Huayna Picchu option is the most popular. 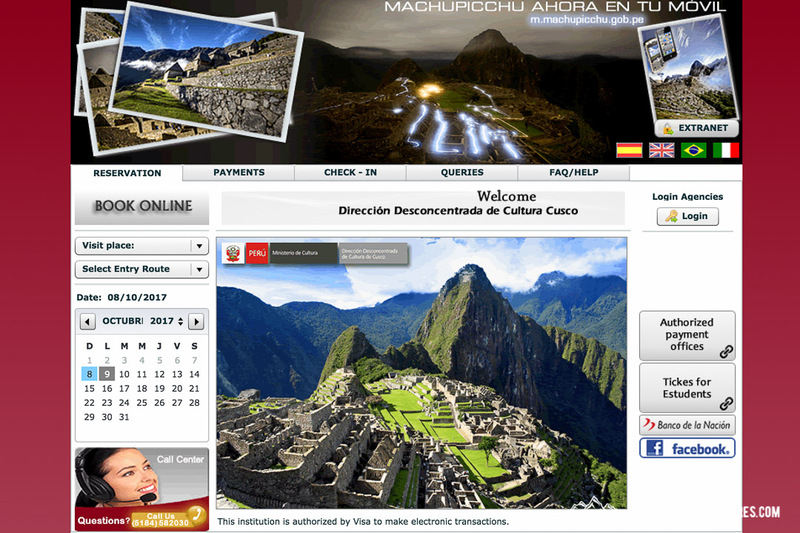 Read this informative, step-by-step guide to help book your Machu Picchu tickets! There are a few options to choose from when buying Machu Picchu tickets. Most people will only be able to buy the Machu Picchu city. The other tickets for Huayna Picchu and Montana Picchu are even more limited. If you had the option to choose, I highly recommend the Huayna Picchu package. It will also include a route option to the Sun Temple. Don’t get fooled by other websites. Their prices have a commission fee on them and will cost more. This is what the official website looks like. The only way to trek to Machu Picchu are through Machu Picchu tours. If you have the time, I highly consider doing the Classic Inca Trail to Machu Picchu because it is considered a top 5 hiking trail in the world. You will be backpacking over the span of a few days so make sure you are physically conditioned. Machu Picchu tours are plentiful. Just make sure to do your research before picking any Machu Picchu tour company. Machu Picchu was abandoned by the Incan in the 16th century, not too long after it was built. The Inca Trail to Machu Picchu was purposely destroyed to protect the location of Machu Picchu. The city of Machu Picchu was impressively built without the use of mortar or steel tools. There are still many secrets to Machu Picchu, and researchers have found not the clear intent of Machu Picchu. Taking pics is cool and all. But first, llama take a selfie.